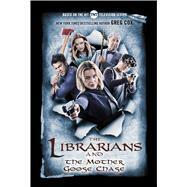 An original novel based on the hit television show, The Librarians by New York Times bestselling author, Greg Cox. Stories can be powerful. In 1719, Elizabeth Goose of Boston Massachusetts published a collection of rhyming spells as a children's book, creating a spellbook of terrifying power. The Librarian of that age managed to dispose of all copies of the book except one, which remained in the possession of Elizabeth Goose and her family, temporarily averting any potential disaster. GREG COX is the New York Times Bestselling author of numerous books and short stories. He has written the official movie novelizations of such films as Godzilla, Man of Steel, and The Dark Knight Rises. He has also written tie-in novels based on such popular TV series as Alias, CSI: Crime Scene Investigation, The 4400, Leverage, Star Trek, and Warehouse 13. Cox has received three Scribe Awards from the International Association of Media Tie-In Writers. His official website is: www.gregcox-author.com.